Coupon code: MARCH19 (valid thru March 15th of 2019). Discount taken at checkout. Designed and Crafted in the U.S.A.
Feel spectacular going from one activity to another! Four colors to choose from. My favorite is purple! Purple pants are fun, versatile and easy to style! Have you ever bought a pair of pants that looked super cute and seemed to fit right when you tried them on, but then they were just so uncomfortable when you tried doing anything in them? This is a common issue among women today. Why sacrifice comfort to look great? Stretchy fabrics generally provide comfort and fit. Fabrics that feel like you are not wearing a thing, yet do not cost you fashion points for wearing those cozy garments. I prefer fiber blends derived from natural chain of polymers like Rayon and Viscose with small percentage of Nylon and Spandex. The softness and breathability of natural fibers along with flexibility and durability of Spandex make for a great combination for fabric that is both extremely comfortable and has great elasticity... Sorry, don't get me started...I can talk about fabrics forever! Luckily, there are things we can do to hide that belly, so that it doesn't get in our way of looking fabulously stylish. Mid-rise pants with "Tummy Control" special interfacing inside the waistband is a great solution! Then, of course there are the cuts that are slightly flared at the bottom, which helps balance things out and elongate the legs. 4. Can We Please Have a Pocket? An invisible pocket inside the waistband is just what the doctor ordered! My customers asked me to add the pocket, mainly for when they travel and go dancing at events or clubs, to safely hold valuables such as credit card or ID. I wanted this pocket to be hidden, so it is conveniently inside the waistband with a small flap, to hold things firmly in place. You see, buying products in America is not just a matter of national pride, but as a small business owner myself, I feel the need to support my local economy. I realize that it is tempting to buy foreign-made products, as they are almost always cheaper. However, they are cheaper because they are made in the countries where it is legal to pay slave labor wages. And I personally feel much better not contributing to businesses that exploit people. We should support each other to help create an environment where all people thrive and are not exploited. As a designer, I have been striving to create styles that look good on different body types. You don't need six-pack abs to look good, just well-designed garment and the correct size. The most important thing is that you feel comfortable wearing your clothes and carry yourself with confidence. Since I began selling them, I have received such an AMAZING feedback, and I can't wait to get them onto the bodies of more women like me. To learn more about the Perfect Pants CLICK HERE! A woman in red is undoubtedly elegant and for many years now the color has been associated with a sense of feminine strength and determination. Red, as a color of power and passion, is seen as exciting, dramatic and even aggressive, but it also reminds us of love and evokes strong emotions. However, people think that styling red pants can be difficult, since it seems that there are only a few solid colors that really work well with red: black, white and blue. I beg to differ... I love to combine red with pale pink, beige, navy and turquoise, but combination of red pants and some prints, polka dots and stripes can look very stylish and sharp. Here are some eye catching outfit ideas for different occasions. Also, pantsuit with casual T-shirt and cool sunglases, I love the look! Different tops paired up with red pants will take you from casual, to the office, and an evening around town. Simple silhouettes, but add some fun details. Cool hand bag and a great pair of pumps will add a touch of seasonal luxe and polish. 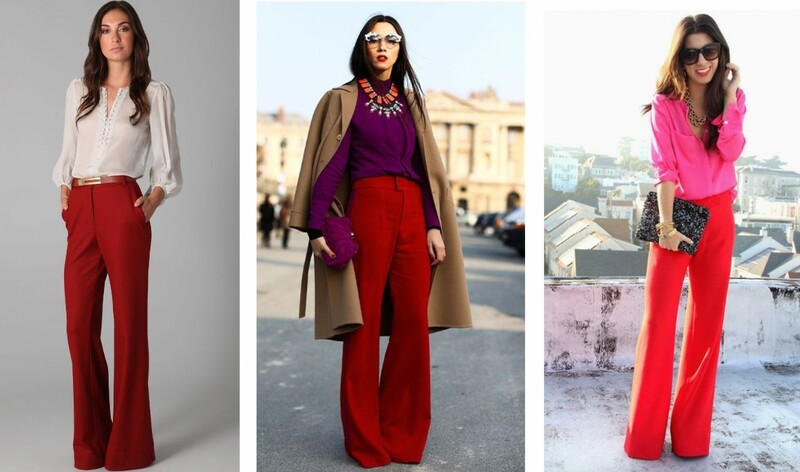 A few more interesting ways to wear red pants! Just like anything else, wear your red pants with confidence! 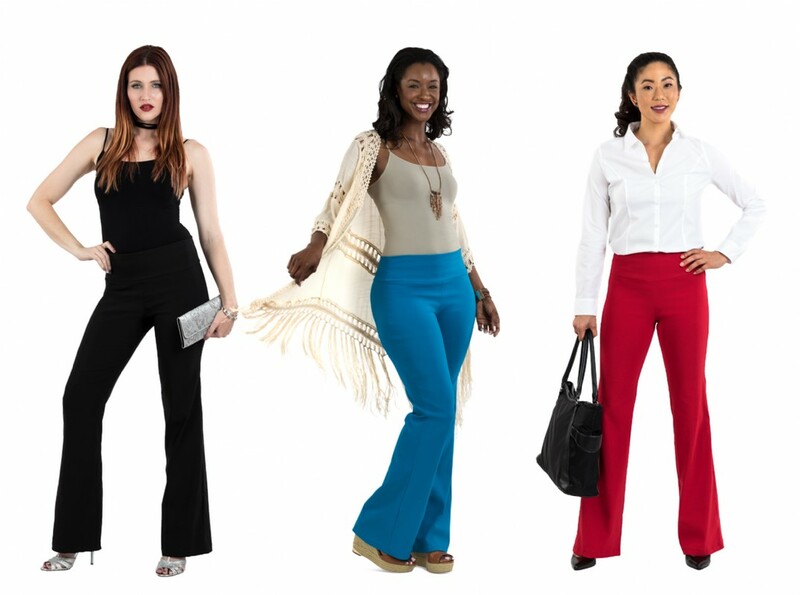 Click HERE and check out our soft, comfy and timeless Noka Posh Perfect Pants in red (with tummy control, and pocket inside the waistband!). And enjoy free shipping on all orders of $49 or more! Why do I love partner dancing? The synchronization of two people is what makes this kind of dancing beautiful. I don't see submissive and dominant. I see partnership, teams that place the woman as equally important as her partner. It is not a relationship between dictator and passive servant, but rather ongoing conversation that requires both parties to be equally involved. Masculine and feminine energies in this form of art are complimenting each other and are not combative. Leader and follower - terms are essentially less gendered, because both partners are leaders and followers. Actually, man follows woman and woman follows man. Both parties are treated as equals and with respect. Each one is independent, but still part of the art of dance as a whole. Usually women of creative passion are drawn to dance. What fascinates me is how much what you wear can affect your confidence levels and your performance as well. Your outfit really can empower you! To me clothes are more about projecting personality, then about obeying the latest trends. This is even more emphasized in performance attire. I guess, that is why I love designing pieces worn on stage or on a dance floor. Dancing is empowering as is, but adding the outfit that completes the character and gives you that attitude is even more powerful. Now, speaking of clothing and power, in general, there are a lot of discussions about identifying power through dress code. My thought is that embracing the feminine side (through dance or fashion) does not make a woman less strong, independent and powerful. There is actually a profound sense of power coming from embodying your gender, not denying it. Women in politics and business, especially, are often terrified that declaring an interest in fashion will have them classified as less authoritative. As a matter of fact, as Vicky Tiel says in her book Ther Absolute Woman: "Three of the first successful, self-made business women of the twentieth century are Helena Rubinstein, Elizabeth Arden and Coco Chanel, and funny enough they were all in the business of fashion and beauty." I just thought that was an interesting topic when speaking of femininity, dance and power. I love following fashion, but it has always been about the style I love, rather then automatically designing what is perceived as trendy. My work is not really about trends, but about character. My designs have to be beautiful and utilitarian, but also made with clear conscience and crafted responsibility. There is an overload of product out there, so you have to choose things that are better for you. The idea is not to be excessive. I want my customers wearing pieces that I design, more then once. Fast, disposable fashion is not my thing. The art of creating clothing and pieces of quality is. My forever inspiration is dance as well as strong, self-reliant women that I create outfits for. Please click HERE to see some great pieces, crafted for dancing. Whether you are dancing socially, or participating in a showcase of different events. Also click HERE if you are a member of a group, we can custom design a fabulous outfit that will add great value to your performance. Posture and Circulation: Is health being sacrificed in the name of style? Can certain types of clothing damage a woman's health? I never thought you should sacrifice comfort while being fashionable, when you don't really have to. Well, I do sometimes wear tight pants, skirts and dresses (still nice and comfy materials though) that are believed to restrict circulation and blood flow. However, I strongly believe it all depends on the fabric choice, its breathability, weight, flexibility and garment fit. They say, skinny jeans, pencil skirts, coats with large hoods, over-size bags, high heels... are believed to be most popular choices that could have negative effect on the body. However, eveything in moderation, I would say! And of course, it depends on how often and how long you are wearing those pieces for. Even with these potential issues, you can still remain fashion-forward without harming your body. As a litle girl, I was overly sensitive to tactile input (I had a bit of a Sensory Processing Disorder, I guess) and as an adult I am still very particular about the materials that the clothing I create and wear is made of. If it doesn't feel good on my skin, I know I will never wear it, therefore I would not want to sell it either. Fabrics are my passion and a big part of my creating process. They have to look pretty, but also be comfortable and of good quality, perfect weight and flexibility. Also, I will choose blends with natural polymers whenever I can, because they give you that amazing comfort, but still maintain the strength of a man-made fiber. Long story short, always pay attention to the type of fabrics while shopping. Even a simple piece made out of beautiful and healthy fabrics can make you feel like a million bucks! Garment fit is another important point that can very much affect your posture, comfort levels, as well as physical and mental health. I still remember my mom consistently reminding me to "stand up straight, pull my stomach in and shoudlers back!" Not only for adequate back support, healthier spine and muscles, but posture is also known to affect your confidence levels. Proper posture will make your breathing easier and deeper, improve circulation and digestion, allow muscles to work more efficiently preventing muscle fatigue, but also very, very important is that it will boost your self-confidence! So, all these points I keep in mind when engineering a garment, whether I am working on performance outfits or ready-to-wear. One of the pieces I created with the purpose of having function, comfort, improving posture and adding to confidence levels are the Noka Posh Perfect Pants. Check them out HERE! You will love them! Free shipping on orders in the U.S.A. of $49.00 or more! Sometimes you need that HOT magenta dress to stand out! Very limited edition! Assymetrical top and bottom dress with soft ruffle. Built-in shorts that will ensure that the dress fits well and stays in place, and never worry about coverage during movement. Perfect for dance parties! Or just parties! Or just dance! I love the fashion of 2018! Ruffles have always been a favorite trend of mine. They create action, flow and add drama to the overall look. It is inevitable that you will end up shaking your ruffles on the dance floor. They just make you move! Flirty hems and romantic ripples... They are so chic and ladylike! Soft or heavy, positioned at hemlines, cross-body, neckline or off-shoulder. There really is a perfect ruffle for everyone. Even though my creations have always been more about the timeless style, then they are about the trends, I love following and incorporating modern elements into my pieces, whether I am designing ready-to-wear or stage attire for my lovely customers. Then adding some bright color accents (sunny yellow is huge this summer! ), sometimes a little bit of bling, and I am just so excited! Fringe is another hit this summer. I found this cool information in British Vogue stating that throughout history, everyone from the ancient Greeks to Marilyn Monroe has had a fling with fringing and tassles. Hera (Greek goddess of women who rules over Mount Olympus as queen of the gods) wears tassled belt that is said to shine and cause excitement. Then in the 50's Marilyn Monroe was wearing a black dress with a plunging neckline and tassled hem while playing her ukulele in "Some Like It Hot". I am so glad these two trends are happening now! Even if you are not ready for a full-on fringe, you can start by adding a tassled or fringed accessory to your outfit. Fringe details just give that refined, retro look. Or if you are ready for more elaborate creations with layers of fringing that bring movement to stylish pieces. We currently have a few styles with ruffles and fringe details with very limited sizes and pieces in stock left, that are great for social dancing or just any summer parties. They will give you confidence and attitude that will just make you move and dance your night away! Click HERE to see more (some styles on SALE now!)! If you order by the end of the day of July 4th, we have an extra special coupon for 25% OFF! PLUS FREE SHIPPING on order of $49.00 or more! Where Fitness Meets Fashion... Why Is Active Fashion Taking Over Your Wardrobe? I am sure you are all noticing that health and wellness has become the new status symbol. So many people are interested in some form of fitness now, which is a very good thing! Well then, I say we may as well be sweating in style! Active Fashion is putting together the formerly separate worlds of fitness apparel and high fashion - sports and fitness inspired clothing. To me as a designer, it makes total sense to be coming up with new solutions, as many women are racing from the conference rooms to their dance, zumba or spin classes. Although exercising can be daunting, stylish active-wear gives us that extra motivation needed to start. There is evidence that what we wear really does affect us psychologically. There is even a term for it - "Enclothed Cognition". Yes, seriously! How cool is that?! There is also a shift in terms of culturally how people spend their money today. It is not even so much about what Prada or Gucci bag you're carrying, it is now about what original active brand one is wearing. So, even if you are not a fitness freak, you are going to want to dress like one. First, because it is comfortable and you still feel good whether or not you're working out, and second, these pieces are becoming more and more part of the overall fashion world. Also, we are seeing previously taboo things like sneakers on the runway at Luis Vuitton and Chanel shows in Paris. The need for everyday comfort is very important in the modern world. Us women are busier then ever before, but thankfully we are learning the art of balance. Whether it is dancing (my favorite! ), rollerblading (another personal fave! ), tennis (love it too! ), running, walking... you name it! Any of these types of movement and activities add up. And they all count! You show up to your barre or yoga class, then off to work, pick up kids... So many of us swear by clothing that can transition from workouts to the rest of our lives. I have never believed you should sacrifice comfort while being fashionable anyways, when you don't really have to. I move a lot and I am more comfortable wearing flexible and breathable pieces. So, being the way I am and working in the fashion industry, this has been very exciting to me! One of the styles that I wear EVERYWHERE are these Noka Posh Perfect Pants with Tummy control. Also, I have been receiving such amazing feedback, and my current customers telling me how much they love their look, feel and versatility. Very classy style! Made locally in the USA!